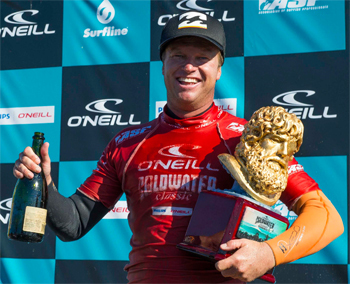 SANTA CRUZ, Calif. – Taj Burrow (AUS), 34, has won the O'Neill Coldwater Classic, Stop No. 9 of 10 on the ASP World Championship Tour (WCT), over Matt Wilkinson (AUS), 24, in solid six-foot waves at Steamer Lane. The event, upgraded to a WCT in honor of O’Neill’s 60th anniversary, ran from Nov. 1 through today bringing the world’s best surfers to Santa Cruz. Burrow quietly advanced through the opening rounds of competition, building momentum throughout the latter rounds while punctuating his efforts on the final day with an amazing variety of forehand maneuvers. Burrow toppled young Brazilian Gabriel Medina (BRA), 18, and goofy-footer Travis Logie (ZAF), 33, on the final day of action before besting Wilkinson for the win. Burrow’s win marks his second of the season after snatching the opening event on the Gold Coast of Australia and now sits at No. 6 on the ASP WCT heading in to Hawaii. “I really wanted to win another event this year, especially since I’m out of the race for the title," Burrow said. "That's pretty depressing, but I’m really happy that it just fell in to place. To get two-wins in a year, I’ve only done that once." Wilkinson was lethal on his backhand, belting the day's high-heat total of 17.73 while defeating Adriano de Souza (BRA), 25, and Michel Bourez (PYF), 26, to attain his first ASP WCT Final appearance. The spunky goofy-footer put in a valiant effort against Burrow in the Final and fell just short of the score needed for the win in the dying moments to finish runner-up overall. Wilkinson was in desperate need of a result entering the event in order to secure his place on the WCT. Michel Bourez (PYF), 26, marched to his best result of the year, besting veteran Damien Hobgood (USA), 33, and Jeremy Flores (FRA), 24, with an amazing array of powerful carving turns while advancing to the Semifinals. Unfortunately for the Tahitian, he was unable to put a stop to Wilkinson’s progressive backhand approach and finished equal 3rd overall. Travis Logie (ZAF), 33, was deadly on his backhand at Steamer Lane, besting current ASP poll leader Joel Parkinson (AUS), 31, in the Quarterfinals while securing his best result of 2012, an equal 3rd place finish. Logie’s tear continued in the Semifinals, posting an excellent 8.33 against Taj Burrow, but the South African was unable to find a backup score against the Australian, finishing just shy of the Final. Logie vaults up the rankings compliments of his 3rd place finish in Santa Cruz, revitalizing his campaign to re-qualify for the 2013 ASP WCT. Kelly Slater (USA), 40, current ASP WCT No. 2, struggled to find a rhythm in his Round 4 bout against Adriano de Souza, finishing equal 9th overall. Despite Slater’s early exit from the event, a 9th place finish replaces his last-place injury points from Brazil, exponentially narrowing the ratings’ gap with current frontrunner, Parkinson. In addition to O’Neill, the event is supported by Philips O’Neill, Surfer Magazine, Surfline. Australian Surfing Life, Surf Session, Surf Portugal, Fluir, Waves, Santa Cruz Conference and Visitor’s Council, and the Dream Inn hotel.